Our Leather Belts are made from thick latigo harness leather. 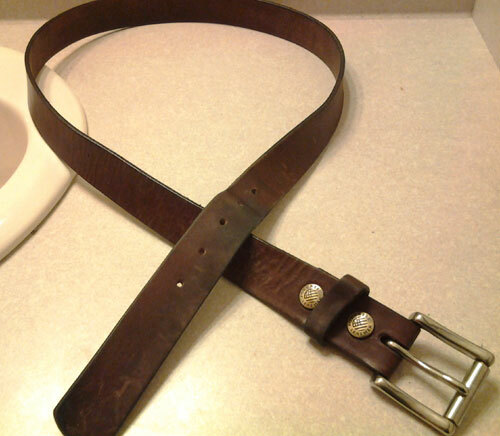 This leather belt is a one piece belt that will not come apart as many pieced leather belts do. Our belts are suitable for dress or casual wear. You get your choice of buckle or choose “None” to order your belt without the buckle. We offer 1 3/8″ Black and Brown belts, and also 1″ Black and Brown Belts. We have recently started making Concho Belts, also available in 1 3/8″ and 1″, and gives you the choice to pick your own options. 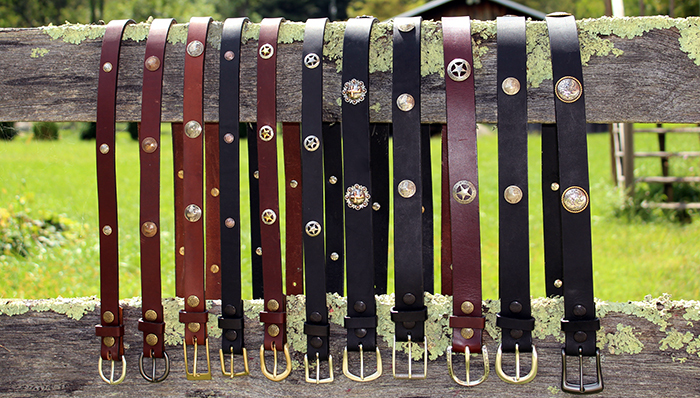 You can choose your belt color, buckle, and your conchos! Each belt has 5-8 evenly spaced conchos, depending on the size of the belt. Our conchos and belts are made in the USA. Our authentic US Minted Coin Snaps are handcrafted right here in Grayson County, VA! Pete, from Wisconsin, has had his belt for a good while now, it’s wearing great! “With my buddha-like physique, I can be hard on a belt. I got tired of seemingly decent belts made in you know where, lasting anywhere from a day to a year. So began my quest for a quality American made belt. Watch this FCL Belt Review and see for yourself!